How do I sum up Thailand? I guess it would be a nation of wonderful people having some growing pains in the democracy department and still struggling to make it past status as a developing nation. Our trip included 16 interesting and easy to travel with people who became friends. We covered a wide gamut of interesting subjects, people and transportation methods along the way. We rode planes, trains, buses, taxies, tuk-tuks, long-tailed boats, rice barges, river taxies, bamboo rafts and elephants to name a few. We visited Buddhist temples with sitting, lying, and standing Buddha; a royal palace; 13th century ruins; a jungle resort and a jungle elephant camp; a rural school; mountain villages; rice fields and rice plant; the Bridge over the River Kwai and Hell Fire Pass; numerous markets including their famous floating market and much more. This collection of photos includes those Beth took as well as mine. We were not always in the same place at the same time and she even visited Myanmar (Burma) while I recovered from a little session of travel sickness. We took over 900 pictures between us and I did my best to narrow them down but still ended up with a little over 100 here. There was just so much to see. As usual these are reduced in size and quality for the net so if you are interested in a print let me know. Many of you already know of our extended vacation when the yellow shirts shut down the airport. We had an extra eight days and seven nights in Thailand that grew old toward the end. I have only included one photo from that time period as I stopped carrying my camera for the most part. 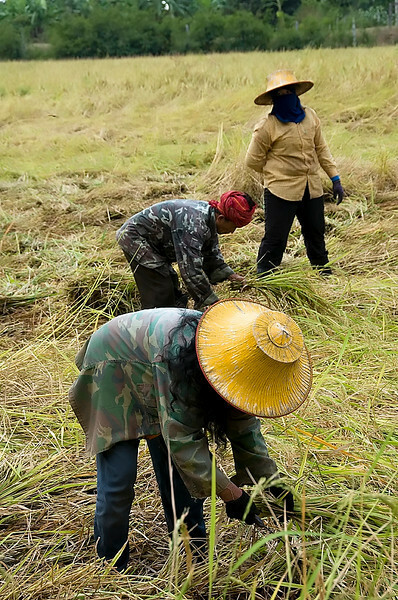 It surprised me that most of the rice harvest we saw was still done by hand.